Xiao He(蕭何)257BC-193BC, is the ancestor of Xiao family. He was born in Pei County (in modern Xuzhou(徐州市沛縣),Jiangsu(江苏),the same birth place as Liu Bang(劉邦).Xuzhou in ancient time is also known as Pengcheng (彭城).Xuzhou is the birth place of Liu Bang, Cao Shen, Xiao He and even the founder of Ming dynasty in 1368,Emperor Hongwu(洪武帝) or Zhu Yuanzhang(朱元璋)was also from the same birth place. Zhu Yuanzhang and Liu Bang were the founders of dynasty who were peasant from the same place. Is Liu Bang an inspiration for Zhu Yuanzhang? Xiao He(蕭何),together with Zhang Liang (張良), Han Xin (韓信), helped Liu Bang(劉邦) to defeat Xiang Yu (項羽) who was the king of western Chu kingdom(西楚霸王)in the battle of Gaixia(垓下之戰), after the collapse of Qin dynasty(秦朝). Han Xin is a brave general,Zhang Liang is a good strategist,and Xiao He is a good administrator(CEO of today), the three of them are called The Three Pillars of Liu Bang's victory(汉初三杰). The period of battle between Liu Bang and Xiang Yu was known as Chu Han Contention (楚漢相爭). When Xiang Yu heard the armies sing in Chu ascent, he knew that he had been defeated and his kingdom had fallen(which is called 四面楚歌) , Xiang Yu committed suicide at Wu River(烏江). Proverb "成也蕭何，敗也蕭何",in English it is translated as " Success was because of Xiao He, and failure was also due to Xiao He". This is due to story that Xiao He was the one recommended Han Xin to Liu Bang, and also the one who caused Han Xin's death. Beijing opera, "Xiao He chasing after Han Xin in the moonlight" 《萧何月下追韓信》. The proverb is refer to an action that is so urgent , that it must be carried out immediately. There is another proverb, "Cao following the rules of Xiao" (蕭規曹隨) refers to the fact that, after Xiao He's death, Cao did not change his rules at all, but followed them. 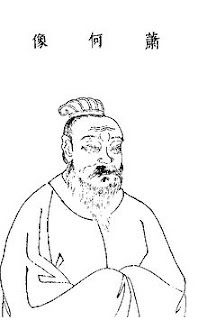 Cao Shen(曹參), was the 2nd Prime Minister, and the proverb refers to "following and honoring the rules set by your predecessors to avoid changes". Noted Xiao He, Cao Shen and Liu Bang are friends during their youth. Note: It is difficult for non-Chinese educated Xiao clan to obtain info on Xiao clan,especially most of the books and documents are in Chinese. It is also difficult to translate as many of the books and documents are in ancient Chinese. The Wikipedia has an article on Xiao He, which is useful for non-Chinese educated Xiao clan.